A range of activities marking the Vietnam-Laos Solidarity and Friendship Year 2017 are underway in the northern mountainous province of Son La, which borders ​two northern Lao provinces. 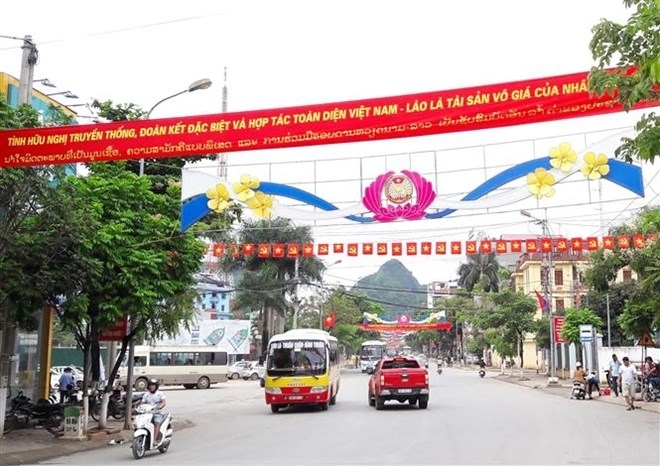 A photo exhibition capturing achievements in development cooperation between Vietnam and Laos kicked off in Son La city on July 5 as part of the second culture, sports and tourism festival in the Vietnam-Laos border area. With 150 photos, the exhibition aims to raise awareness of officials, Party members, soldiers and people of ethnic groups of the traditional friendship, special solidarity and comprehensive cooperation between the two nations. It also affirms guidelines and policies on maintaining and enhancing the Vietnam-Laos special relationship. Another exhibition displaying cultural and tourism products of the ten Vietnamese provinces bordering Laos and five others in the expanded northwestern region opened in Son La city the same day. The three-day event is to boost trade promotion, cooperation and connectivity between the localities while bringing into full play their potential and strengths. The ten provinces bordering Laos include Dien Bien and Son La in the north, Thanh Hoa, Nghe An, Ha Tinh, Quang Binh, Quang Tri, Thua Thien-Hue and Quang Nam in the central region an the Central Highlands province of Kon Tum.